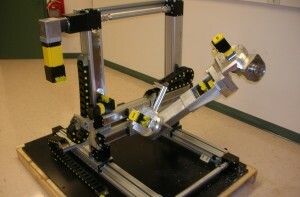 The Flexible Robotic Environment (FRE™) philosophy is shown here a new robotic drilling arm application. The picture to the right shows how we break up the different axis for better repeatability and control of the end effector drill system. Imagine moving a robotic drilling system to your large parts and easily setting up the process. The end effector may also be changed out to any other processing device required. This robotic drilling solution has redundant degrees of freedom to precisely move the tool into the perfect position on your parts. The software for the control of this system is our A2 controller and ModusCAM Solidworks Cad-To-Motion application. As noted above this is the easiest CAM software on the market to assist with the set up of your process. Follow this link to all our PDF company handouts. Check out all of Flexible Robotics Environments System Videos on YouTube here. Give us a call when you want to get started on a robotic project and we should be able to help guide your company to the right solution.